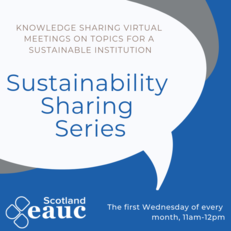 EAUC-Scotland virtual 'Sustainability Sharing Series' April 2019 edition discussed working with your students union or associations on sustainability. We have produced a best practice document from the knowledge exchanged during this session. It is available to download from the bar at the right of this page. The Sharing Series is an informal online sharing opportunity, where people working within further and higher education are invited to meet through our virtual meeting software to share their experiences and questions on specific sustainability topics. We aim to produce a 'Best Practice' guide following each session to document and share the learning. We will be covering a range of topics over the year varying from encouraging virtual meetings to outdoor learning. The sessions takes place on the first Wednesday of every month from 11-12. The full schedule is available.